Ref: Board’s letter No.E(G)2009 QR-1-2 dated 22.03.2017. The issue of permitting the Railway officers/staff posted on E.C.Railway to retain Railway quarters at their previous place of posting beyond 31.12.2017 has been considered by the Board. 2. 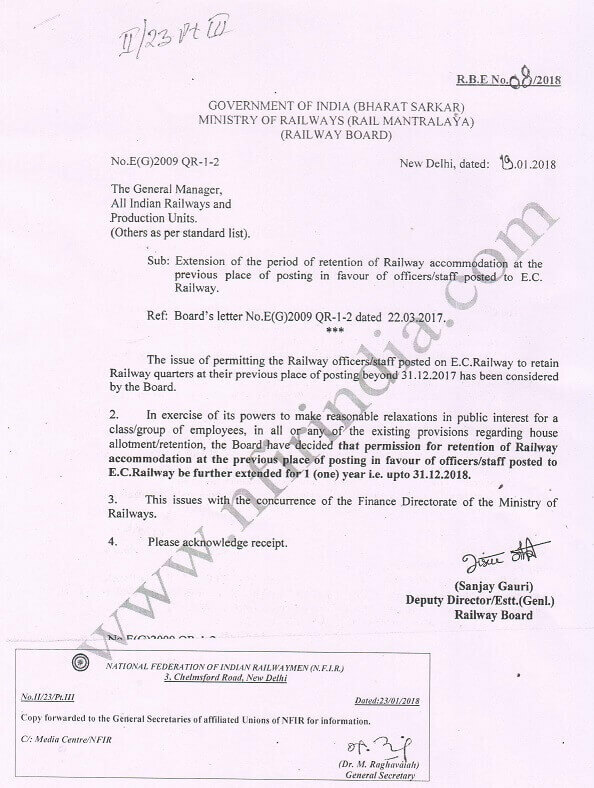 In exercise of its powers to make reasonable relaxations in public interest for a class/group of employees, in all or any of the existing provisions regarding house allotment/retention, the Board have decided that permission for retention of Railway accommodation at the previous place of posting in favour of officers/staff posted to E.C.Railway be further extended for 1 (one) year i.e. upto 31.12.2018. Board have decided that permission for retention of Railway accommodation at the previous place of posting in favour of officers/staff posted to E.C.Railway be further extended for 1 (one) year i.e. upto 31.12.2018.